. The perfect round-up for this week! I’m more relaxed just looking through these.
. Sequins forever! I’d do my entire life like this post if I could.
. Beyond excited to see this band at Hardly Strictly this weekend!
. Some calmspiration to ease into the weekend. I looked at this and pretended I was on vacation.
. Amazing modern to one of my favorite Kate Nash songs. I’m a sucker for modern dance. You’ve guessed it – I’m off to Hardly Strictly Bluegrass, San Francisco’s three-day, not entirely bluegrass-focused, bluegrass festival. It’s always a weekend of good friends, great music, and drinking beer in the sunshine. What could be better? Happy weekend! 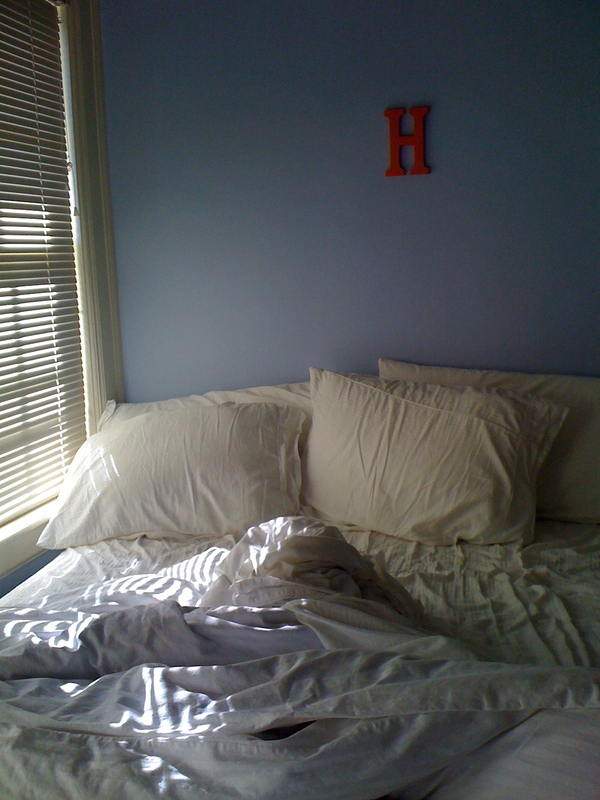 I am particular about my bed. And my PJs, the temperature of my room, my sheets, and pretty much everything else pertaining to my sleep. My boyfriend says I have an affinity to my bed that normal people don’t have, and it’s been suggested to me numerous times that I probably love my bed way, way too much. I’m in bed as I type this. But if we humans spend a third of our lives in bed, shouldn’t we look fabulous and feel amazing for that third? My sleep requirements include soft fabrics, broken-in sheets, a cup of peppermint tea before bed, and a beautiful sleep mask that keeps the light out and lets me sleep in. Even if it’s just for a glorious five extra minutes. We all need it, we don’t get enough of it, we love to talk about how much we’re getting (or not getting), and we love to discuss the details in the morning. Sleep is a funny thing in our culture, because without those precious restorative hours we’d be slow, drunk-feeling, and unable to learn new things or even remember how to do what we already know, according to Time Magazine. But it’s also a badge of honor to go without it. Bill Clinton famously functions on four hours per night, as do Martha Stewart and Condoleezza Rice, apparently. Maggie was recently paid to sleep and write about it. And, obviously, there are people out there paying other people to go to sleep and write about it. We’re obsessed. I am an unabashed, (mostly) unashamed eight hours per night sleeper. From my infancy (seriously, ask my mom) I have been a paragon of crankiness if I don’t sleep, and now, at 26, I can be beastly if I shortchange myself even a few hours. My ideal schedule is 11:30 p.m. to 7:45 a.m., give or take that extra 15 minutes. It’s a schedule I am militant about adhering to when I can, though I work at a theater company, where shows routinely end at 11 and after-parties last until 2 a.m., which seriously messes with my sleep schedule. One hour before: No music, TV, magazines, e-mail, or anything else that will activate the short attention span section of my brain. Books are great because I can focus on one story, one “voice” and there are no pictures. 30 minutes before: Yoga. If I haven’t been in a few days, it’s been a bad week, and it means I really need to stretch. I’ll do a few downward dogs or back twists on my floor just to release the tension and marshall my energy into one thing, instead of letting my thoughts fly everywhere. 20 minutes before: turn on the fan to cool down the room. Your basal body temperature drops when you sleep, and if my body temp goes down as I transition into sleep mode, I’ve found that I fall asleep faster. 15 minutes before: brew a cup of peppermint or chamomile tea. 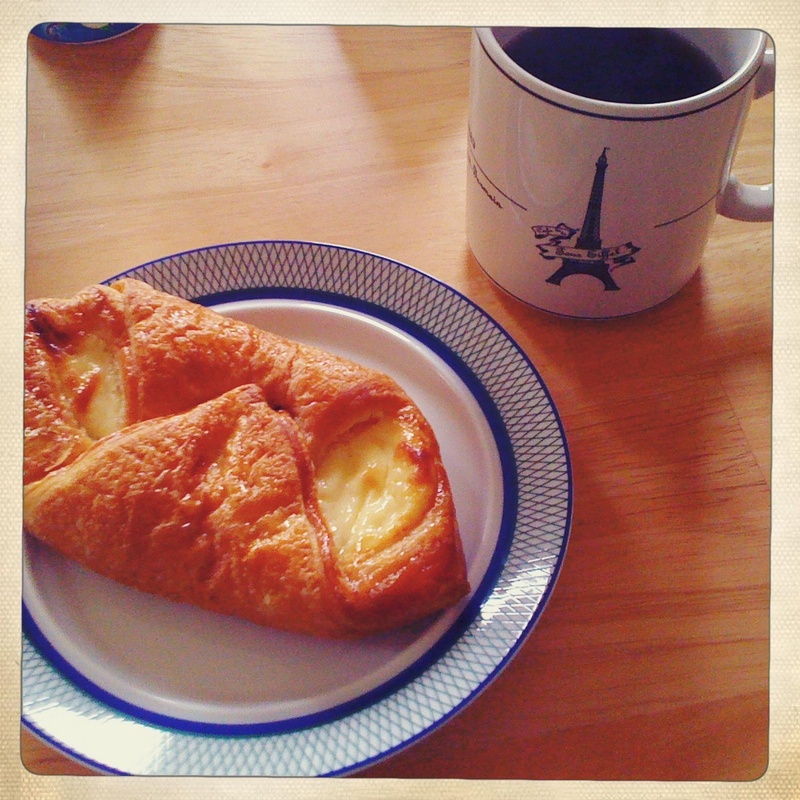 The warmth, the smell, the ritual all helps signal that it’s chilldown time. I also leave at least 15 minutes to read, if I haven’t already. Not only is reading a calming activity, but I get angsty if I don’t read every day. I am a girl who reads. Five minutes before: turn off all the lights, cover up all the blinking electronic lights, find my sleep mask, set my alarm, put my journal on the nightstand, and snuggle in. If I don’t fall asleep right away, it’s either because my brain is still whirring along (deep breathing and journaling usually stop that) or it’s because the temperature is wrong, and a fan/blanket/socks/no socks adjustment is in order. 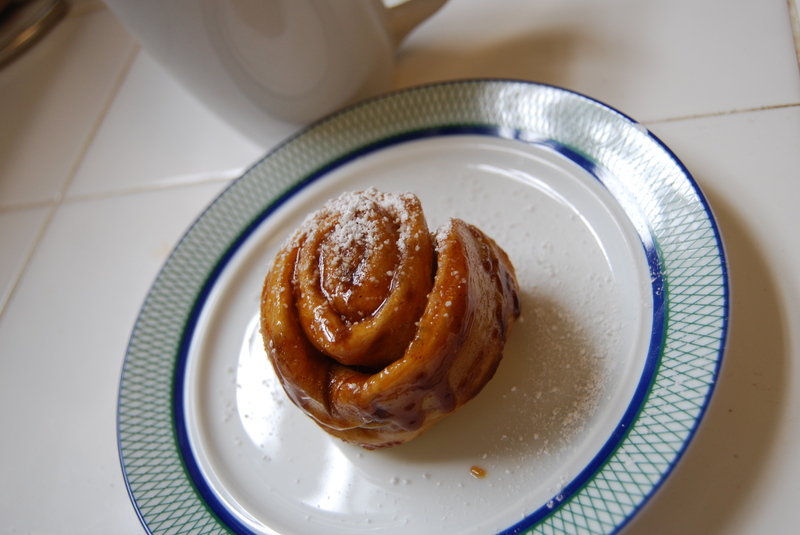 If there is anything more comforting than homemade cinnamon rolls or sticky buns, I would like to know what it is. Like, right now. Because nothing I have ever made comes even close to the warm, spicy enveloping feeling of a mug of hot coffee and these buns. It’s like a snuggly blanket for your soul. Note: I did not say snuggie. Because eww. As with many delicious and heavily carbohydrated things, it’s all starts with Joanna’s five minute bread. If you haven’t already, read the first four steps, as they will give you the bread of your dreams, and they will also bring you up to the place where we’ll start the sticky bun recipe. For the sake of clarity, however, I’ve listed all the ingredients and steps in this entry, too. And because I’m nice like that. If you have time to make this in the morning, it would be the best morning ever, but it also makes for a very happy afternoon snack, dessert, or as a method of wriggling into the hearts of your roommates forever and ever. No snuggies necessary. 1. Mix the yeast and water in a big mixing bowl – the biggest you have – and let it rest while you measure out the flour and salt. 2. Mix in flour and salt until everything is fully combined. You can do this in a KitchenAid mixer, or by hand. 3. Cover the dough in Saran wrap and let it rest at room temperature for at least two hours, but up to five is fine. 4. 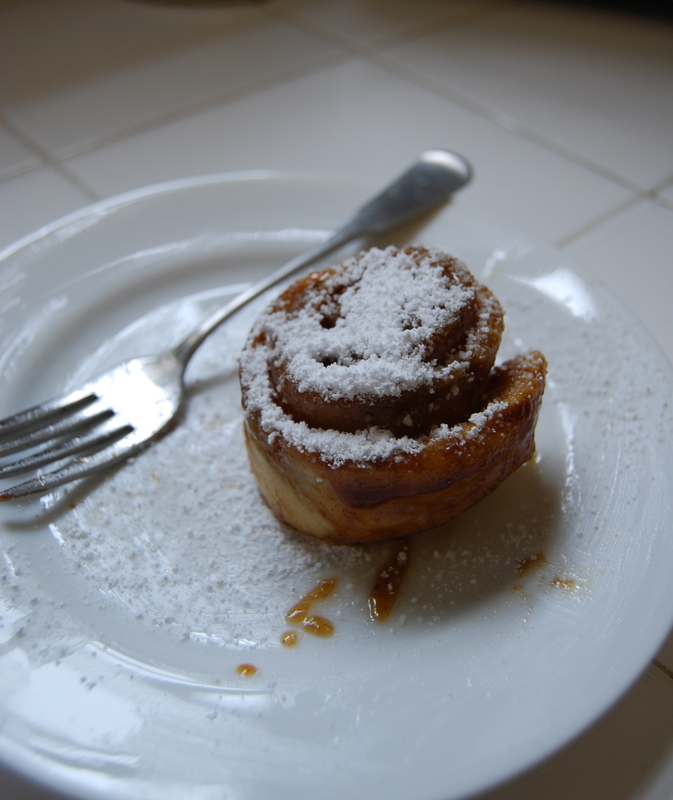 While your dough is rising, mix the sticky bun filling, which is, like so many other things on this blog, a mixture of the heart and of the preference, more than a mixture of the measurements. 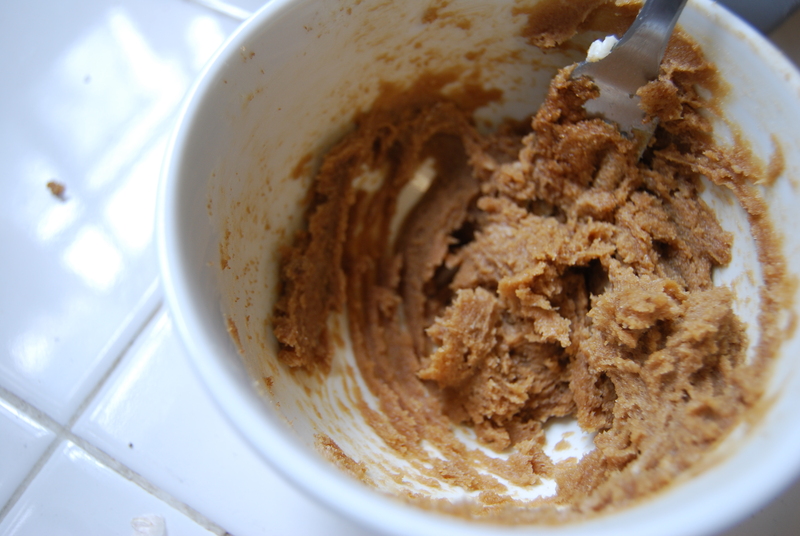 Cream together butter, cinnamon and brown sugar until well combined and spreadable, adding more spice or sugar to taste, and more butter if you need more to work with. It’s not exact, which is what I love about cooking. If you do not love that about cooking, this may not be the blog for you, and for that I do not apologize, but I do propose that perhaps we go have a drink sometime? You seem nice. We could still be friends. 5. Uncover the dough. By now, it should have risen a considerable amount and be sticky, wet, and quite stretchy. If it isn’t, move it to a warmer spot and let it continue to rise. 6. Preheat the oven to 450 degrees. 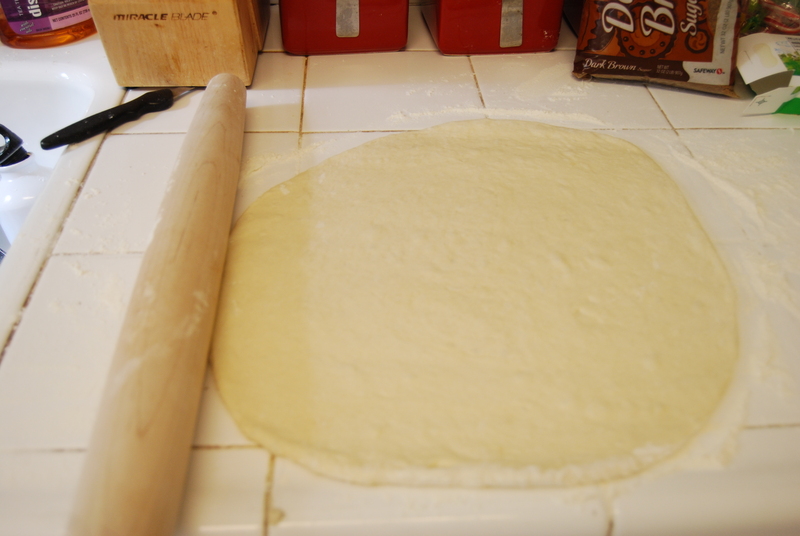 While the oven is heating, roll the dough out into a large circle, of medium thickness. Remember, you don’t want sad, overly thin, anorexic buns, but they also need to be small enough to fit into a cupcake pan, which was a genius idea if I do say so myself. 7. 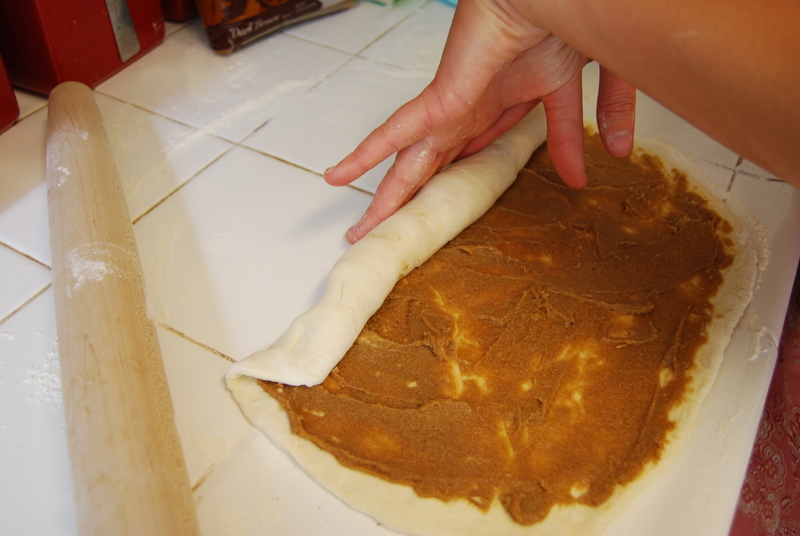 Spread half the creamy filling across the dough, all the way to the edges. Then, roll it up into a large log, taking care not to flatten it. 8. 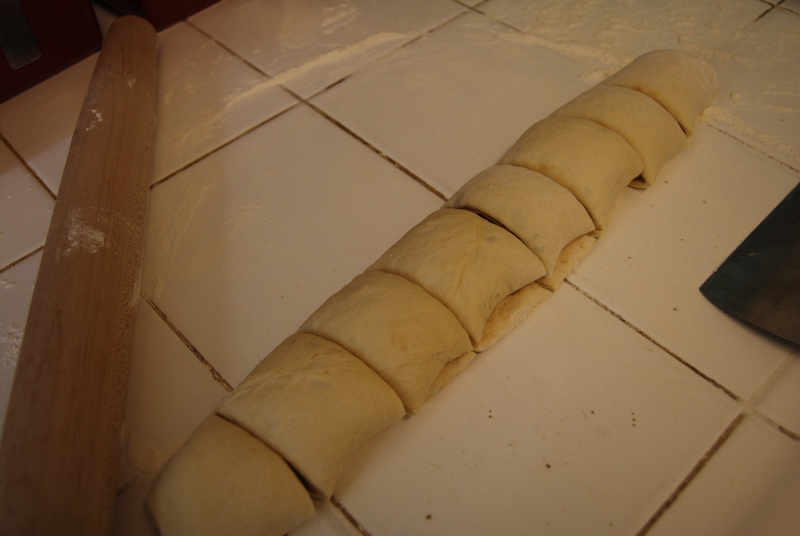 Cut the dough log into bun sized increments. 9. 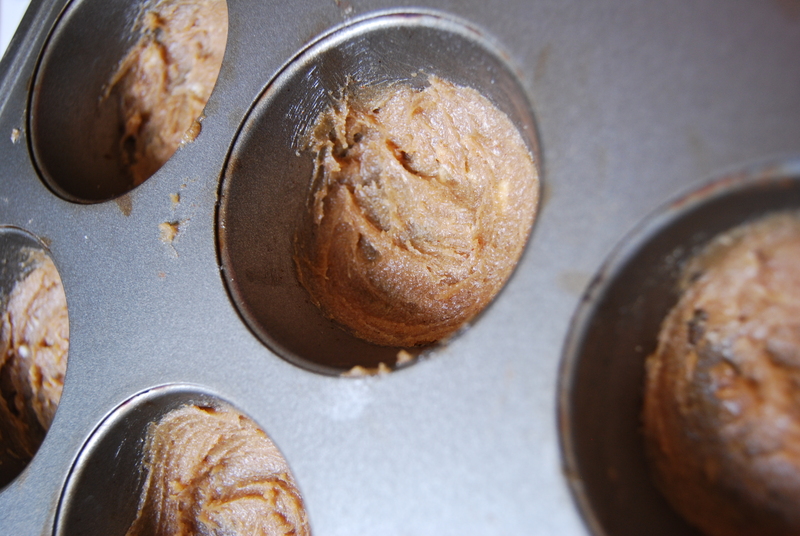 Spread the remaining half of the filling into each indentation in the cupcake pan. 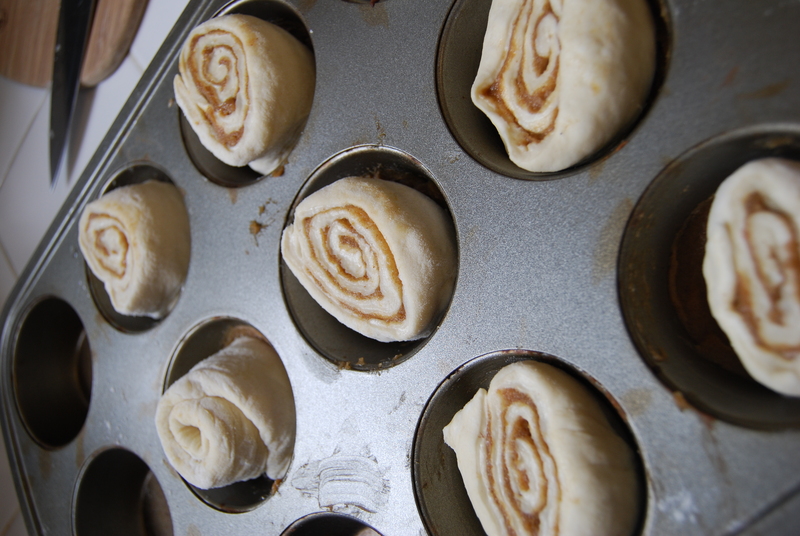 If you were to do this in a pie pan, or a large cake pan even (the normal way to do sticky buns), you would just spread the filling across the bottom of the pan and group the buns together so they stick, both to the filling, and to each other. At the time of bun making, my pans were otherwise engaged, so I thought popping them into a cupcake pan would be both workable and tidy! Turns out, I was right. My favorite thing. 10. Drop the buns into the pans and bake for 15 minutes. My oven runs hot, and our buns were on the petite side, so just pay attention the first time you do this to know what precise time works for you. 11. 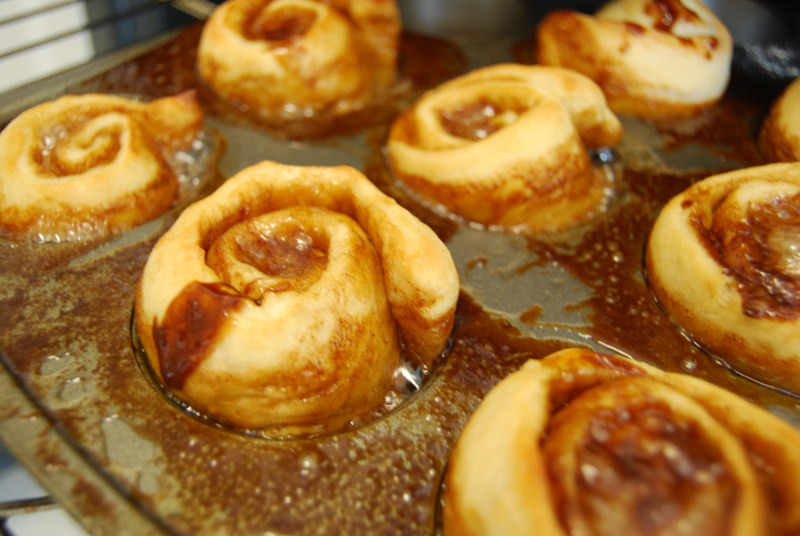 Done buns should be bubbling and well coated in the filling, which by now, has risen up and over the tops of the buns to glaze it in a beautiful caramel color. They should not be burning however, so again, just pay attention. Put down the wine glass, woman/man/person who is cooking right now! Glossy and bubbly, not burnt or too brown. 12. Sift confectioners sugar over the top and serve with hot coffee or a cup of tea. This time of year is strange for me. In San Francisco, the weather’s just getting nice and we’re in the throes of an Indian Summer at last. But 24 years of living according to normal seasons means that I crave the feeling of settling in, hunkering down, feeling wistful about the fall (wistfall?) in preparation for winter. I’m like a little grizzly bear. 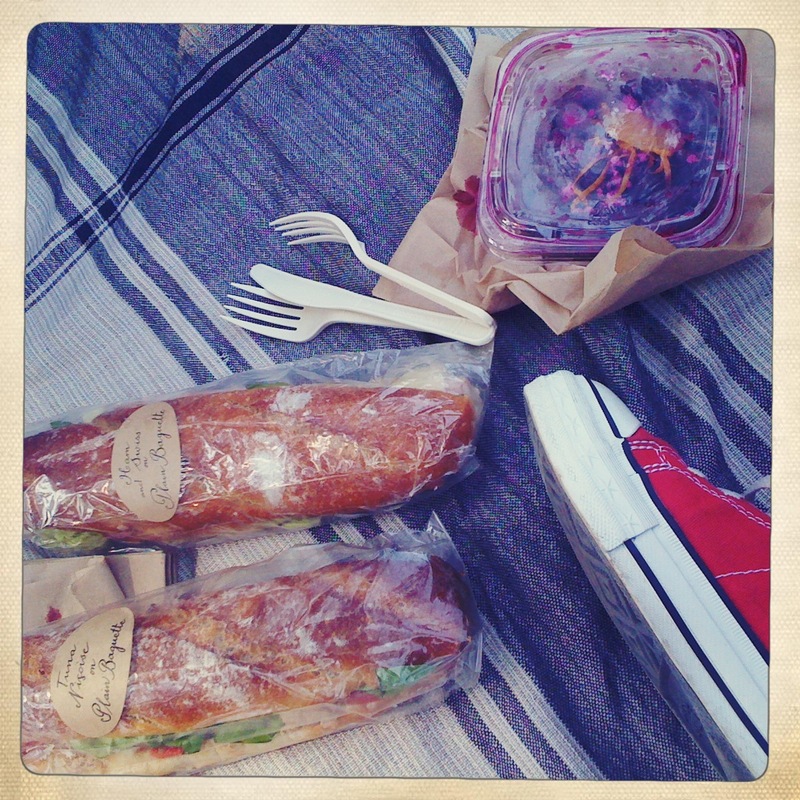 This week, we’re talking comfort – weather be damned! – and what it means to us. That’s, you and me us, not me and me us. I don’t have a multiple personality problem, I swear. Is comfort a certain pair of pants? A hot mug of tea? A feeling you get when you’re home at last? I’d love to know. As we settle in for whatever comes our way, I say, we do it in comfort.
. Loving Jordan’s oxford-under-a-long-sleeve tee + kicky shoes combo. Such a great way to layer without adding bulk or sacrificing her cute, tailored look.
. Searching for color…will distract you for hours.
. Putting the Himalayas on my travel wish list immediately. Whoa dang.
. I got in! Did you? Happy Fall! The next few weeks are my favorite time of the year. I can’t wait to welcome the season with pumpkin pancakes, a bike ride, and a bonfire on Ocean Beach. Are you doing anything to ease into a new season where you are? I wanna know! You guys. YOU. GUYS. Prepare to have your world rocked. Is all I’m saying. Let’s start at the beginning. Remember this week? Lemon yellow? All things sunshiney and good? I had the best of intentions to make lemon curd that week because it just made sense, but with work and rehearsals and special events, it didn’t happen. So I waited and waited, and the fog became foggier and foggier, until I just couldn’t take the crappy SF weather anymore. And so, in honor of fashion week – and all its crazy colors! – I’m so excited to present sunshine in a jar, ie, lemon curd. 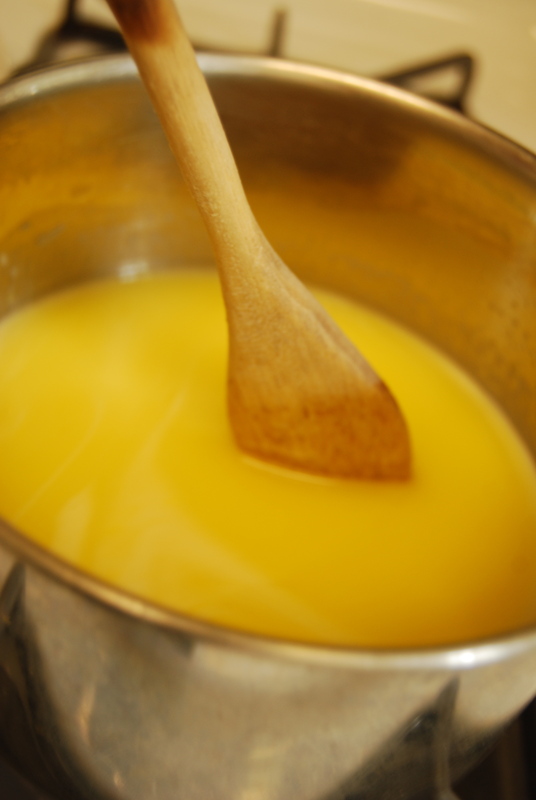 Most recipes call for straining the curd, while simultaneously saying that your lemon curd should be “satiny” smooth. 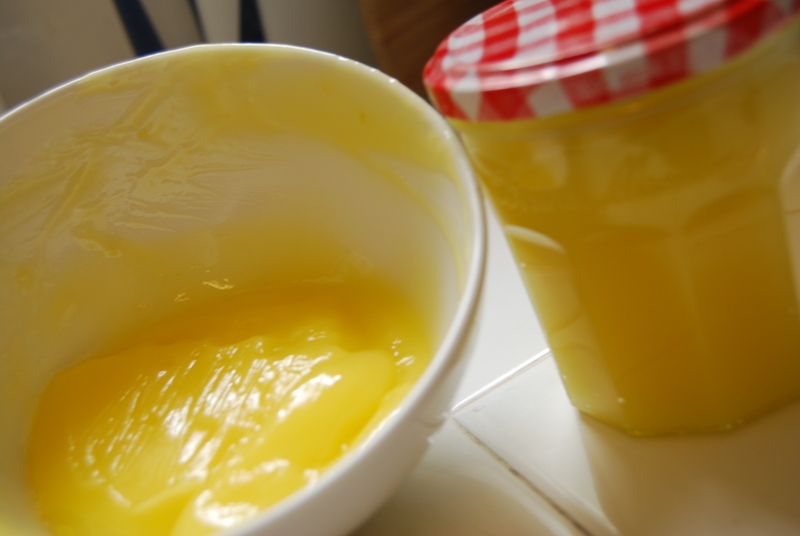 Satin-like seems to be the major goal of lemon curd making, because everyone is all satin, satin, satiny, but somehow you are supposed to achieve this when mess, mess, messy straining is involved. After not very much searching, I used this wonderful recipe, which called for zero straining, and instead, lots of straight up hand mixing. And that was just great. 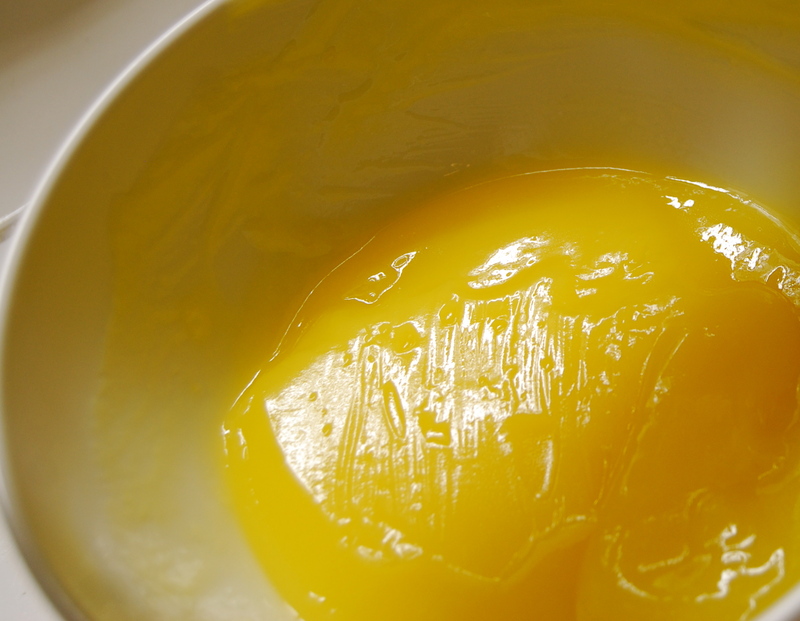 So, behold: the satin, satin, satinyist lemon curd that you ever did see. Sunshine in a jar.
. Pinch of zest, up to a teaspoon, if you like to be zesty. I do not. 1. Get all your ingredients together first. 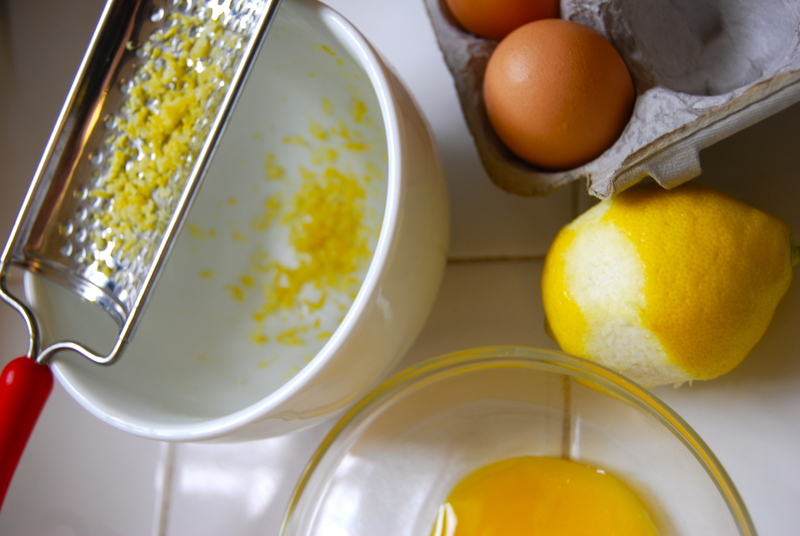 This recipe calls for some fast mixing, and it won’t do to try and yolk your eggs or juice your lemons halfway through the process. 2. 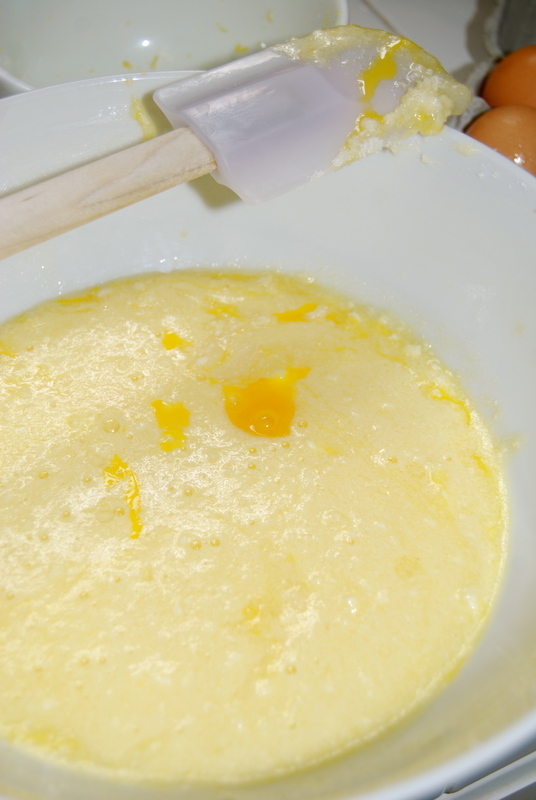 Cream together the butter and sugar, add in the eggs and yolks slowly. Once it’s fairly well blended (about a minute), add the lemon juice and beat for a few more minutes. It will be: runny and chunky. Do not be: alarmed. We will fix it. 3. Pour the mixture into a large saucepan over low heat and let it cook until it smooths out. Caveat: mine never totally smoothed in this step, which is okay. 4. Turn up to medium (never high – this should never boil) and begin stirring continuously. Yep, just keeeep stirring. The recipe says to stir continuously for 15 minutes, and some of the commenters said they only stirred for five, but I stirred for a whopping 35 minutes continuously (I know, I’m tired too). I think the key is to not let it be too hot, and to use your best judgement. When the curd is thick enough to stick to the back of a wooden spoon, you’ve done it. 5. Pour it into a jar or bowl, cover with saran wrap so a skin doesn’t form, and refrigerate. It will continue to gel as it cools. 6. Eat it. Preferably in a pie or on a scone, but if you’re a true Suzy Fat Pants like I am, you might just attack it with a spoon. And that, my friends, is just great.